How Does DAT Bootcamp Calculate Estimated Scores? We use our own scoring system. Each DAT Bootcamp practice test is scaled differently according to its own difficulty. 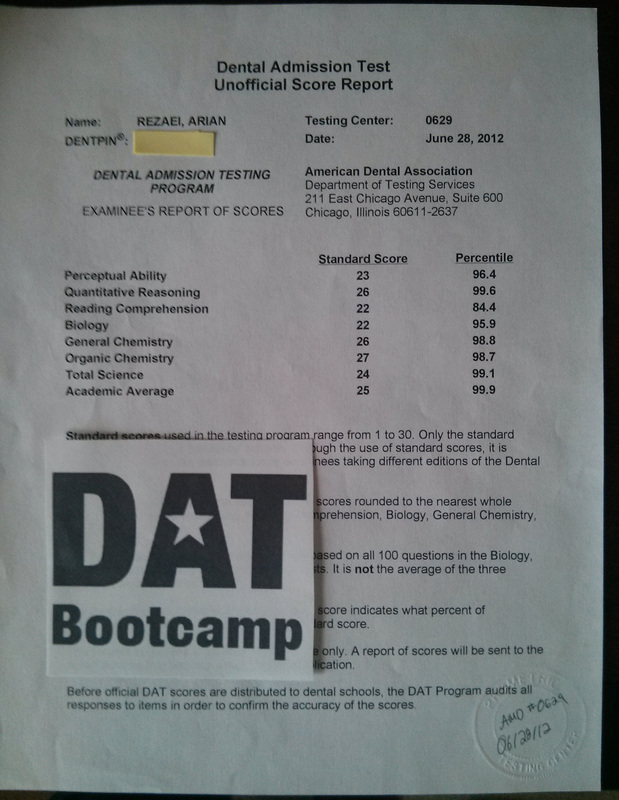 Therefore, you cannot use the 2007 DAT scoring chart to convert your raw score on DAT Bootcamp. The 2007 DAT scoring chart is scaled specifically to the 2007 DAT. The 2007 chart cannot be generalized to other practice tests. However, our tests should be used as a study tool first and score estimator second. It’s critically important that you review the explanations to the questions you missed. ALWAYS review the questions you did not immediately know the answer to (or how to go about solving). This will help you score higher. You shouldn’t be taking comfort in high scores or getting nervous and losing confidence over low scores. Focus on the questions and review for DAT Bootcamp, and the scores will come. This post will teach you how to properly review your tests to get the most benefit out of them. Important: Only the full-length ADA tests calibrated by the ADA are the true indications of your scores. These should be taken a few days before your exam to get the best picture of where you stand. That is the only time I would recommend taking your estimated scores seriously. You can then decide whether or not to postpone your DAT. When am I ready to take the DAT? So how do you know when you’re ready to take the DAT? We have an entire strategy post on that here (https://datbootcamp.com/blog/when-am-i-ready-to-take-the-dat/). In relation to your estimated scores, however, you basically want to at least be scoring a 20 to know you’re doing well. The average for acceptance into dental school is a little less than 20 AA now, so that should be your minimum target score. If you want to score exceptionally higher, you have to work much harder and study very diligently.